Keith Schaefer of Oil and Gas Investments Bulletin profiles a micro-cap oil company with land in a prime area. Small oil producers have been shunned by the market, making them extremely cheap now—giving the whole sector lots of leverage for investors. The one I’m focused on this year is Jericho Oil Corp. (JCO:TSX.V; JROOF:OTC). It’s the smallest company I can find in the best play—which right now looks like the STACK play in Oklahoma. It was the rare micro-cap that had cash in 2015/16, and was able to buy STACK assets for pennies on the dollar. It now has over 70,000 acres across Oklahoma, and is just completing its first two wells in the STACK. STACK is an acronym; it stands for Sooner Trend Anadarko Canadian and Kingfisher (the counties involved). The STACK is located in the Anadarko Basin in Oklahoma where there’s three stacked formations—the Meramec, Osage and Woodford. In total they’re about 900 feet thick—that’s a lot of oil (and very importantly, a lot less gas). As the charts below will show, it’s the lowest cost play in the U.S. And Jericho Oil is the smallest pure play I see on it—with just 450 net barrels production right now. That will change quickly now that Jericho is switching from growing its land base to growing its oil production. It has just drilled its first two wells in the STACK, and results are pending. And all through 2018, Jericho will drill one well every six weeks into this lowest cost oil play in the United States. Being a micro-cap, nobody has heard of the company or the stock. Stocks are so cheap in the sector that when you double or triple production—which Jericho should do this year—your stock can also double or triple. Jericho bought is land so cheap, its full-cycle returns should be well above average. With a steady string of well results and triple-digit production growth, this little company will quickly gain a much larger audience. Jericho’s entry into the STACK is a lesson in how to exploit a cyclical business. Its acreage came indirectly from Samson Energy—a leveraged-up KKR buyout that went bust when oil collapsed. Jericho knew the play very well, so when it looked at that acreage on a Thursday morning it were able to put in a solid bid that evening. No other junior could have lined up capital and turned around a deal that fast. In fact, no other junior could have done that deal at all back then. That’s where The Big Money backing comes in, and I’ll explain who that is shortly. But with this transaction Jericho was able to acquire core STACK land for $2,300 per acre—a fantastic price then and an even better price now. Today, nearby STACK transactions are being valued at almost 10X that price, up to $20,000 per acre. Getting acreage in this play is tough. 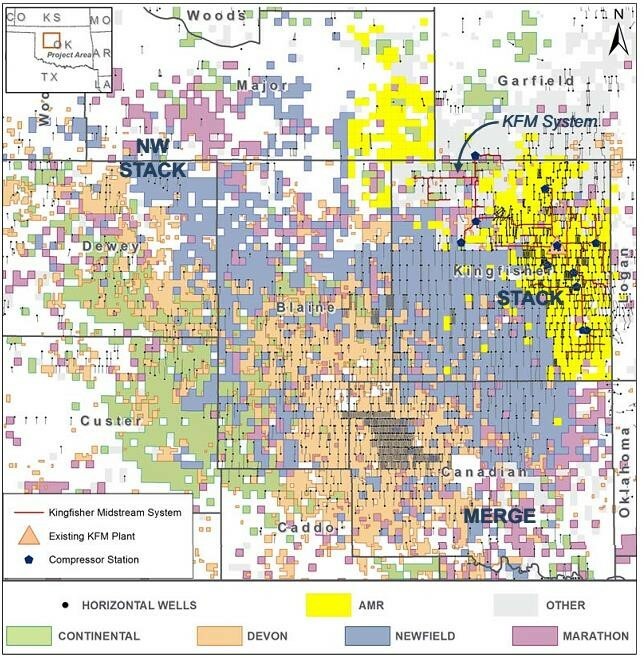 That’s one reason why investors don’t hear as much about the STACK play: five large independent producers—Devon Energy (DVN-NYSE), Continental Resources (CLR-NYSE), Marathon Oil (MRO-NYSE), Newfield Exploration (NFX-NYSE) and the newly listed Alta Mesa (AMR-NYSE) have all made the STACK their primary focus and own almost all of it—and all except AMR don’t issue promotional press releases on drill results. The map below from Alta Mesa shows that those five big independents control most of the acreage in the STACK—which means that getting into the play at this point is extremely difficult. The real core of the play is in Blaine, Kingfisher and Canadian counties. You will notice that almost all of that acreage in those counties is colored or spoken for by one of the five independents. An exception to that are the white blocks in northern Blaine County between Newfield (grayish/blue) and Alta Mesa (yellow). A lot of that acreage belongs to—you guessed it—Jericho Oil. That is a very enviable place for a junior oil company. There is always someone ready to buy your land position—especially now that the oil price has moved up from the $40/barrel it was back when Jericho bought this land in mid-2017 to $60/barrel today. Better still, Jericho CEO Brian Williamson believes that because the company has such a dense land position, there are many opportunities for it to make what’s called “tuck-in” acquisitions—small adjacent acreage positions. With Jericho controlling most of the parcels of land, it doesn’t make much sense for larger competitors to chase the remaining available acreage. The whole point in buying a beaten-down micro-cap is that if you double your assets, the stock should have a similar jump. There’s a simple reason why The Big 5 Operators in the STACK grabbed such big land positions—because that is where the highest returns in the U.S. are. Click on image for larger format.The chart above from Newfield shows the STACK over-pressured oil window having a break-even oil price of just $25 per barrel. The average STACK well is not much more than that—as good or better than everything else in the United States. 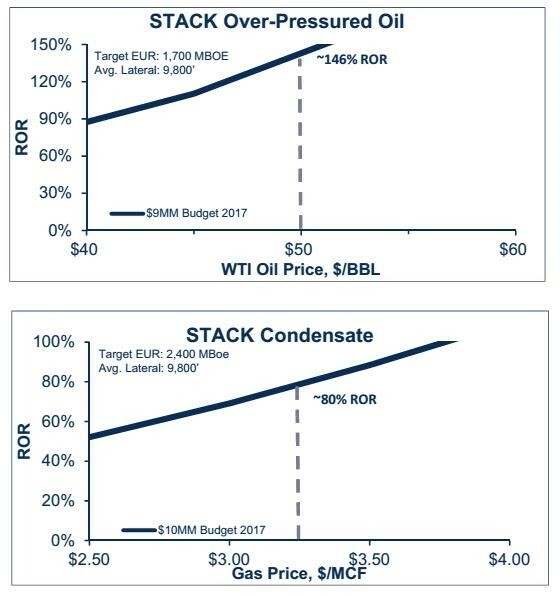 The chart below from Continental shows that STACK IRRs at $50 oil range between 82%–146% depending on whether the wells are in the over-pressured oil or condensate windows. My rule of thumb is that it takes 75% rates of return to get me interested. The STACK meets that test easily and does so at $50 WTI—so imagine how profitable STACK wells are now here at $60 and if oil prices were to rise. 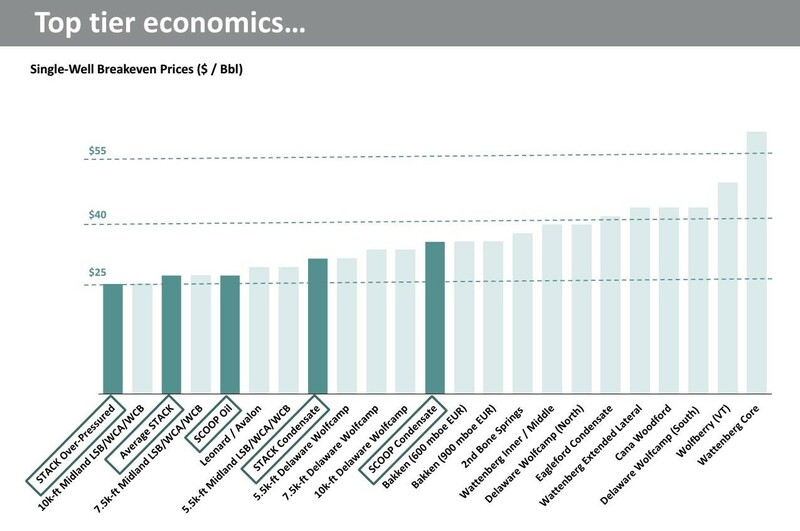 One of the main reasons for the STACK’s great economics is its higher oil weighting than the Permian (the Permian actually gasses out very quickly). And with natgas production in the U.S. skyrocketing up some 6 bcf/d (billion cubic feet per day) this year and the same in 2019—energy investors want “oily” stocks. Jericho Oil has already accomplished the hard part. The company got into the STACK in a big way at a very low price, quickly and quietly, and off investors’ radar, all the while being surrounded by large E&Ps with billion-dollar budgets. It was able to buy a lot of land because it could raise money from a wealthy group of backers…who still own huge chunks of stock today. If you scan through the shareholder filings—all in the public domain but takes some time—you’ll notice a shareholder with more than 10% called The Breen Family Trust. That’s affiliated with Ed Breen. He is the former president of Motorola, then he took over Tyco once it fell down, and he now finds himself as CEO of DowDupont (DWDP-NYSE). And he’s a large Jericho Oil shareholder. Jericho’s other Big Supporter is Oklahoma’s own Michael Graves, who sold his two oil companies to Chaparral Energy in 2006 for just over $500 million. Those companies—Calumet and JMG Oil—had land positions in the area where the STACK is now. So he knows that area. That is Some Big Money behind little Jericho, which allowed it to write 7-figure checks in the worst oil market in 20 years, grabbing land everyone else wanted but no one else could afford. But now the land buying is over. Now Jericho is drilling, and drill results will flow, well, like light oil. Williamson expects Jericho’s first well results from the Meramec formation to come in mid-late March. The second well—into the Osage formation—will be done this spring as well. Then investors should get results from one well roughly every eight weeks over the remainder of the year. In doing so, CEO Williamson believes the company will quadruple production from 450 boepd to over 2000 boepd by year-end. That kind of production growth will obviously be a big catalyst for Jericho’s share price. Normally I’d be inclined to think that when a company triples its production it can triple its share price. We’ll see if the market agrees with me. That drilling isn’t just going to drive production growth but reserve growth as well. Williamson believes each well drilled proves up a minimum of seven surrounding drilling locations. That will mean a HUGE increase in the reserve report for 2018—which will get the company its first big operating line of credit (read: non-dilutive capital). As the oil price stays in the low $60s, investor attention will move downmarket. Micro-cap oil shares are so cheap that once bids start piling in, the first moves will be big. It’s the smallest company—backed by the biggest investors—in the lowest-cost oil play in the US. That’s where the best leverage is—time and time again. I’m long, I’m excited and as drill results hit the market—very soon. Readers can subscribe to Oil and Gas Investments Bulletin here.